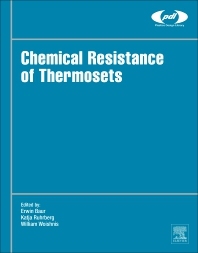 Chemical Resistance of Commodity Thermoplastics provides a comprehensive, cross-referenced compilation of chemical resistance data that explains the effect of thousands of reagents, the environment and other exposure media on the properties and characteristics of thermosets– plastics which are used in a range of applications. Specifically, the resistance data in this book covers the following materials, allyl, epoxy, unsaturated polyester resin, unsaturated polyurethane resin, vinyl ester resin, furan resin, polyaminobismaleimide, acrylics, polycyanurates and filled/reinforced thermosets. A huge range of exposure media are included, from aircraft fuel, to alcohol, corn syrup, hydrochloric acid and salt to silver acetate. This book is a must-have reference for engineers and scientists designing and working with thermosets in environments where they come into contact with corrosive or reactive substances, from automotive and aerospace, to coatings, adhesives, electrical insulation, fittings and other applications. Erwin Baur attended the Technical University of Aachen, Germany where he studied Mechanical Engineering, specializing in Plastics Technology. He was previously a member of scientific staff (1984-1989) at the "Institut für Kunststoffverarbeitung" (IKV) in Aachen. He is currently founder and Managing Director of M-Base Engineering + Software GmbH: a leading international supplier of material databases, systems and software. Katja Ruhrberg is Material Data Manager at M-Base Engineering + Software GmbH in Aachen, Germany. She received her degree in Civil Engineering from the Technical University of Aachen and later spent six years as a Member of the Public Relation Staff at an institute of the RWTH (heinisch-Westfälische Technische Hochschule) Aachen. William Woishnis launched the first version of 'Chemical Resistance' in 1989, and went on to co-found William Andrew Publishing the following year. He later co-founded Knovel, offering a ground-breaking combination of online books and data, providing engineers with a productivity platform that is still widely used today. He passed away on August 2, 2009.